"You could drill holes, but at the risk of getting chips and burrs in there." Standard engineering practice when drilling metalic material and not getting chips/swarf in the item being drilled is to dip the drill bit end in grease before drilling. The chips/swarf remain stuck to the drill in the grease. Keep on removing the bit and cleaning the grease /chips off and re-greasing, Very little if any $%^& will end up in the bearing. Same tip works when cutting threads in a hole. This is really a fantastic and simple solution. It would be easy to insulate the plywood duct supports and I think it could actually look pretty nice. Continuing on this idea, what changes would need to be made to mount this on the roof in a more horizontal position instead of on the ground vertically? Are you thinking of a horizontal axis or a polar axis? Because of the side thrust on the bearings I don't think a turntable bearing would work well, nor the metal duct as a "shaft". You would have to get creative. Then there are the holes you'd have to cut in the roof. Finally the wind loading, anything on the roof better be extra strong or it risks being blown away (leaving a couple big holes). I don't think I would do it. Are you thinking of a horizontal axis or a polar axis? Because of the side thrust on the bearings I don't think a turntable bearing would work well, nor the metal duct as a "shaft". You would have to get creative. Then there are the holes you'd have to cut in the roof. Finally the wind loading, anything on the roof better be extra strong or it risks being blown away (leaving a couple big holes). I don't think I would do it. I was thinking of orienting it parallel to the roof. The roof angles down to the south at about a 10 or 15 degree pitch. We are reroofing our house this year and I can have all the attachment points and ducts professionally incorporated into the roof. I understand that the bracing for wind load would need to be quite strong. Again, I'm just considering the roof mount. I may stick with the ground mount and running the ducting through the eaves under the roof. Although with my roof and eave design it may be nearly impossible to get a duct through there. See photos. The brick goes all the way up to the interior ceiling height and the roof comes down to the eaves in such a way that I don't think I can get a duct into the attic. 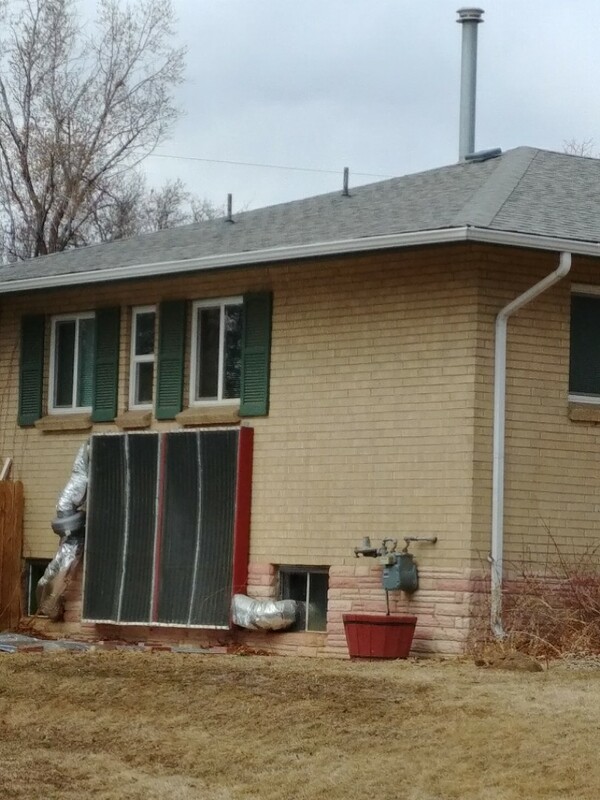 The current solar furnace goes out from and into the basement through the windows. Regarding wind loading. 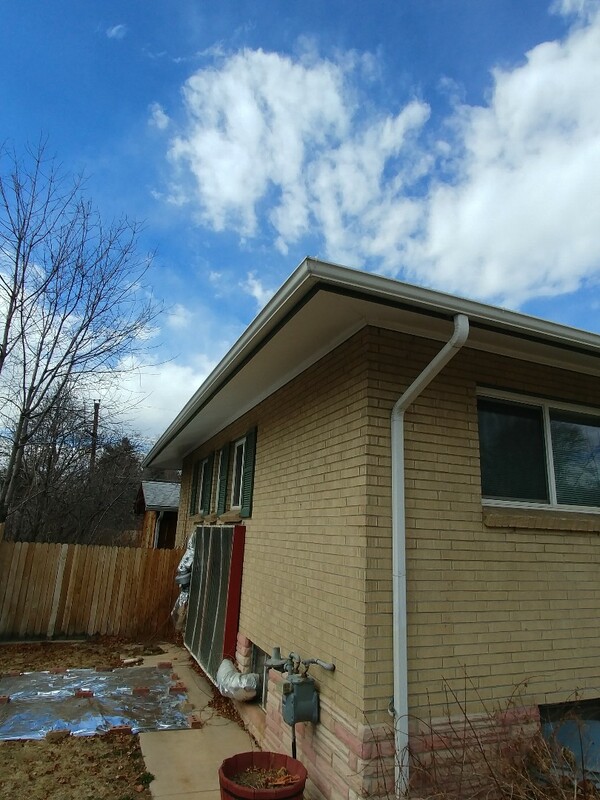 There are several houses in the neighborhood that have hydronic solar heating and hot water systems on the roof and I can use them for a reference on what's needed for anchoring. I think rotating a solar PV panel makes some sense as the efficiency is so low compared to solar air heat. But solar heaters are far more efficient; as much as 4-5x more efficient. 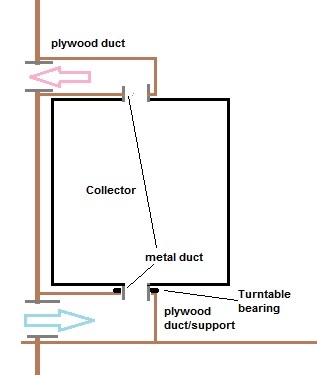 To rotate a large solar air heater seems like you would compromise a collector design. If you need early or late day heat, consider making two collectors, angled SE and SW respectfully. If you have limited yard or horizontal space, build a taller collector. Just don't lose sight of the goal of cheap heat while working out the details of making the collector rotate. My ZP collector runs for 6 hours during the shortest sunny winter days. It will run for at least 8 hours today. That's a lot of heat from a static, south facing collector! If it's more or less parallel with the roof and doesn't move it's doable as the collector is edge-on to the wind. I thought you wanted a rotating collector. My roof mounted water heater as well as my PV array went through Hurricane Irma last fall with ZERO damage. We logged 100 mph winds and lost 2 trees, but the solar stayed put. Problem with a DIY air collector (besides the holes for ducts) is you'd just about HAVE to cover it every summer. I've tried to figure out how to heat my garage with one, but that's what stopped me. A collector that was hinged on one side so that it stowed face-down in the summer or for storms might work. Paint the back white. If it's more or less parallel with the roof and doesn't move it's doable as the collector is edge-on to the wind. I thought you wanted a rotating collector. My roof mounted water heater as well as my PV array went through Hurricane Irma last fall with ZERO damage. We logged 100 mph winds and lost 2 trees, but the solar stayed put. Problem with a DIY air collector (besides the holes for ducts) is you'd just about HAVE to cover it every summer. I've tried to figure out how to heat my garage with one, but that's what stopped me. A collector that was hinged on one side so that it stowed face-down in the summer or for storms might work. Paint the back white. I'm starting to lean towards a fixed panel mounted on the roof and vertically parallel to the roof but tilted slightly to the east. This would give me earlier morning heat and the existing wall mounted collector would still provide the long lasting heat that comes up from the basement into the house. I know I would need to cover it at the end of spring each year. Sort of a pain to do that, but it's just a twice a year thing. Not too bad considering the ongoing cost savings of solar. As far as it being parallel to the roof, I wonder how it will do with snow load? My roof isn't particularly steep. We have lots of electric solar panels on the same houses in the neighborhood that are at the same angle. They always get some snow buildup. I may just need to reinforce the polycarbonate with more braces than usual. PV panels seem to do OK with the snow load, though I've seen photos of a couple where the snow (ice?) got UNDER them and lifted them. I don't know if the panel itself was damaged or not. You could probably find out via Google. A vertical thermal panel on the roof would probably do well as long as it's well braced. You might want to raise it a bit from the roof so snow or whatever can shed by going under the panel. Here, I'd also want to be able to lay it flat if necessary.